We came across something today on the ever-surprising Internets that has our brains doing whatnows and ohnotheydidnts all over the place, and we need your help to get a handle on the situation. 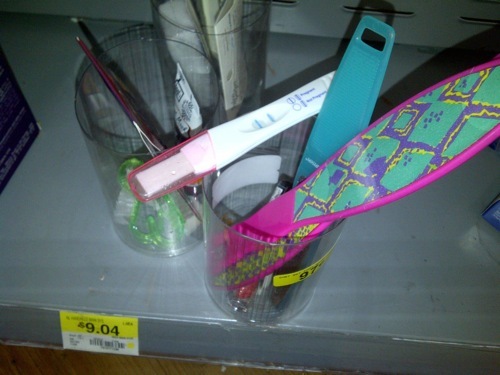 Specifically — ahem — are people really stealing pregnancy tests and peeing on them right there in the aisle? This all came about because of a Reddit post where a user submitted a photo that is purportedly of a shelf at Walmart. Items on the shelf include various tools for scrubbing your feet, pumice stones and the like and then, delicately balanced on the cups, a pregnancy test. That is positive*. Which means someone peed on it. In the aisle. And left. It. There. Some commenters are critical of the set-up being one at an actual Walmart — wood floors? Odd assortment of products? — and while it’s unlike any Walmart we’ve ever seen, others are chiming in that they’ve heard of this scenario. I’ve heard (from Shrink Prevention or whatever they call security at Target and Walmart) that pregnancy tests are one of the top stolen items. People apparently do this a lot. Rather than trying to get the kit home, or sneak it into the bathroom, the women will just squat down and pee on it in an aisle. A lot of places keep pregnancy tests behind glass now for that reason. I’ve seen condoms behind glass too. People must be stealing those a lot, as well.